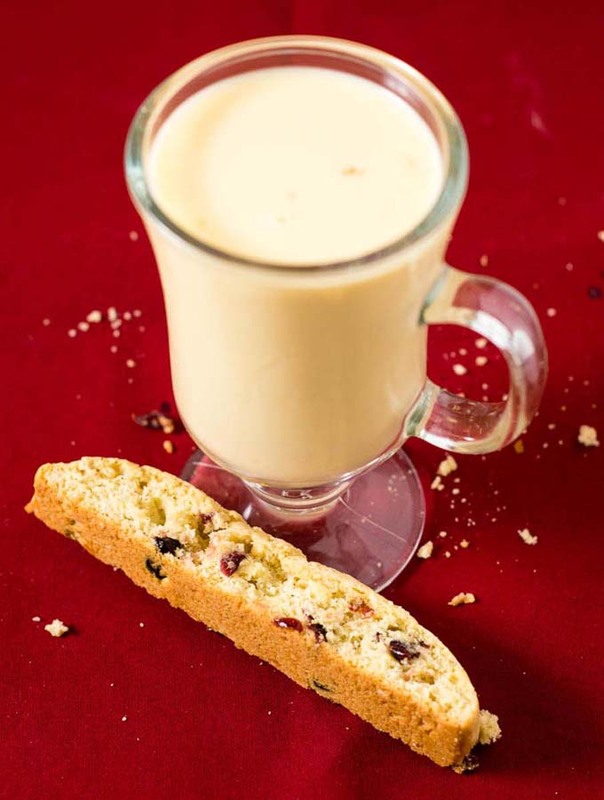 ‘Tis the season for cranberry eggnog biscotti! 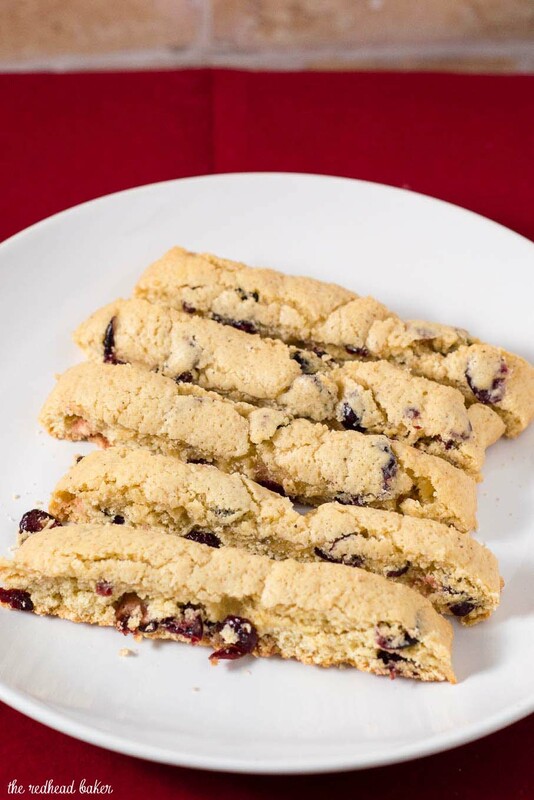 These crunchy, sweet cookies are loaded with sweet-tart dried cranberries. Welcome to Day Two of Christmas Cookies Week! When I think of Christmas flavors, eggnog is always the first to pop into my head. I love eggnog. If you take a peek at the recipe below, you’ll see there’s no actual eggnog in the recipe. 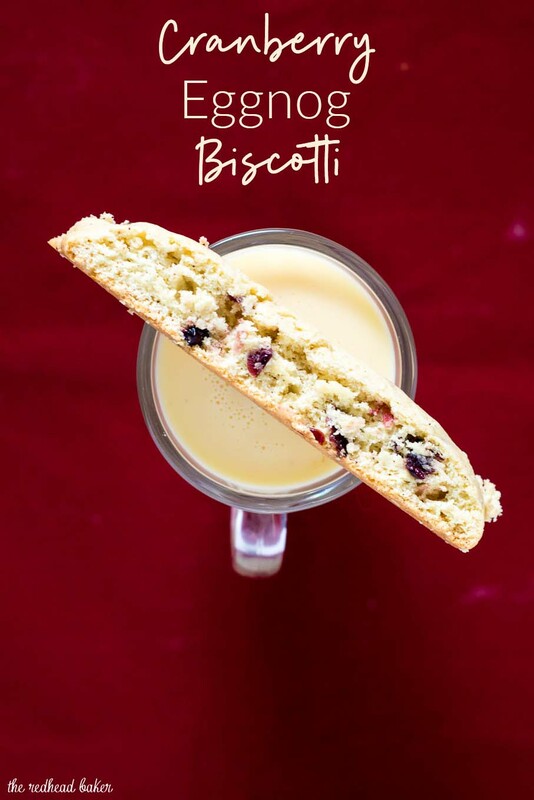 Biscotti is a dry, crunchy cookie, so liquids aren’t typically added to the dough. Instead the flavor comes from nutmeg and rum extract. Rum extract is a concentrated flavor of rum. If I added regular rum to the dough, I’d have the same problem as I would if I had added eggnog to the dough: I wouldn’t have a dry, crunchy biscotti cookie. Also, some parents aren’t comfortable giving baked goods to children that contain alcohol. Using rum extract also alleviates that problem. To add some flavor and textural contrast, I added some dried cranberries to the dough. Dried cherries would also work well, but it’s much easier to find dried cranberries in grocery stores. 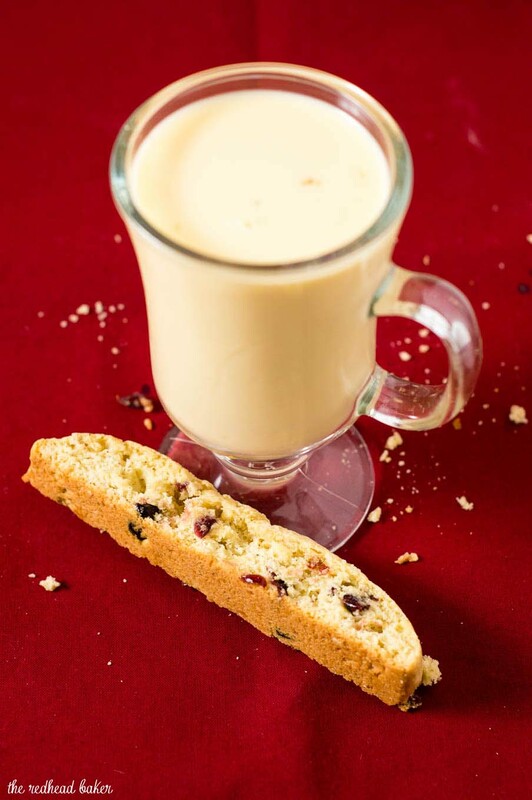 You could also dip the ends of these eggnog biscotti in white chocolate. 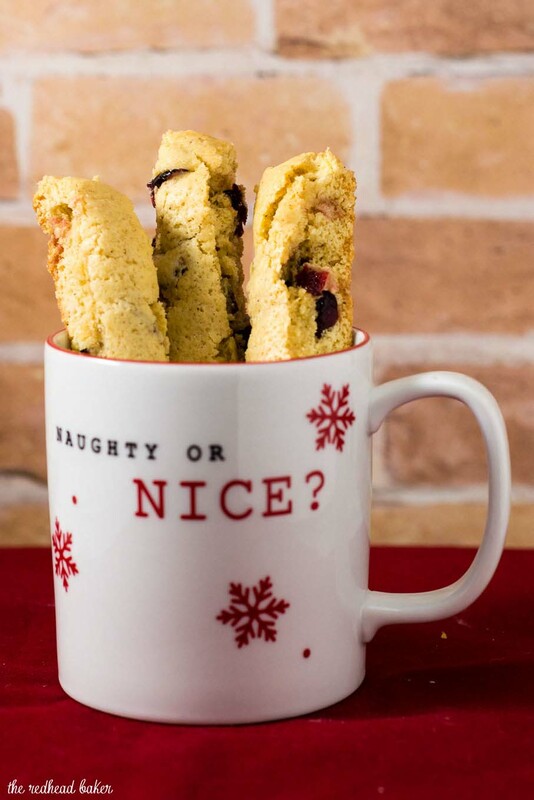 Enjoy these biscotti with your coffee or a glass of traditional eggnog. They can also be placed in a cellophane treat bag, tied with festive ribbon and given as a hostess gift. Heat oven to 325 F. Line ungreased cookie sheet with parchment paper or silicone baking mat. Set aside. Combine flour, sugar, baking powder, salt and nutmeg in large bowl. Add butter; beat at low speed until mixture resembles coarse crumbs. Add eggs and 1 teaspoon rum extract. Beat at medium speed until well mixed. Stir in dried cranberries. Divide dough in half; roll each half into 14-inch log. Place logs 3 inches apart onto prepared baking sheet; flatten each log to about 2 inches wide. Bake 20-25 minutes or until set. Cool 10 minutes on cooling rack covered with parchment paper. Reduce oven temperature to 275 F. Remove logs from parchment to a cutting board; use a serrated bread knife to cut the logs on the bias into 3/4-inch slices. Be sure to cut straight up and down so your slices are even from top to bottom. Place the slices upright on the cookie sheets (cut sides perpendicular to the baking sheet). Bake 30 minutes or until lightly browned. Remove from cookie sheet. Cool completely. Check out more Christmas Cookie recipes! 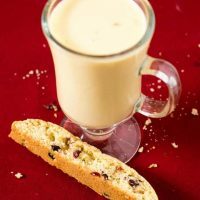 I love serving Biscotti with coffee in the morning and this festive recipe would be perfect with coffee after dinner as well. Did you know that December is national eggnog month? These are perfect for celebrating!